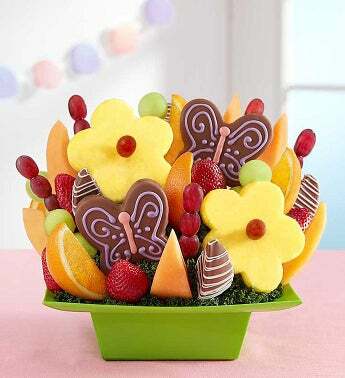 Sweet pineapple butterflies and daisies make this fruit arrangement a true garden of delight! Our scrumptious surprise is also blooming with crisp dipped apple slices, plump strawberries and more. Both pretty and plentiful, this colorful creation makes a wonderful gift for any day worth celebrating.